One of the biggest struggles with teaching younger students is simply the lack of motor skills. Through no fault of their own, young piano students cannot isolate fingers to play typical five-finger beginning piano music. If you have any doubt, try wiggling your ring finger without moving your other fingers. Now ask a four year old to do the same. There’s quite a difference, isn’t there? There are several ways to work on developing the fine motor skills required to be proficient at the piano. Today, I’m going to give some tips on gaining agility and dexterity though all five fingers. Many of you know I have a four year old daughter. I enrolled her in a series of preschool handwriting classes last summer (before her fourth birthday) with a friend and local occupational therapist who uses the Handwriting Without Tears curriculum. 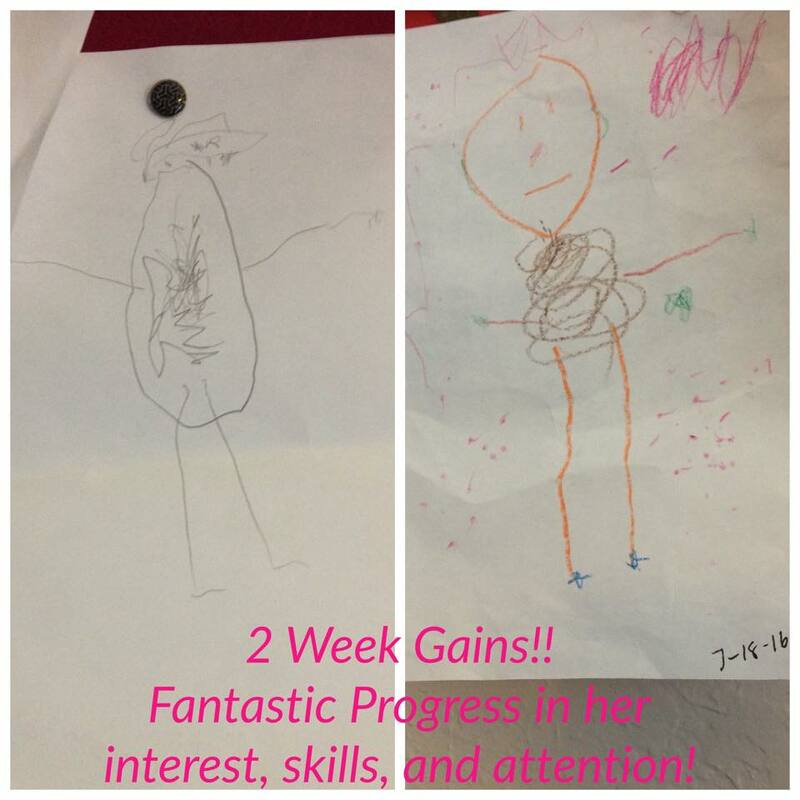 The difference in her writing and drawing skills in just four weeks was amazing. One of the things they do in their very first class is draw a picture of a person, who is called Mat Man. In the first photo, you can see my daughter’s drawing from the first day of class. In the second photo, you can see her drawing from just a few weeks later. There is substantial improvement (you can actually tell it’s a person in the second photo!). What you cannot see in these photos is the confidence my daughter gained in her coloring skills. 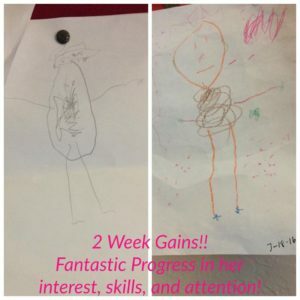 Within a few short weeks, she went from rarely drawing or coloring to drawing or coloring daily and LOVING IT. I learned a few things too! I know how to help students develop a proper pencil grip now, and I learned a cool technique called Wet-Dry-Try. I’ll show you how to use Wet-Dry-Try for music theory with the youngest pianists in March. Another way to develop those tiny fingers are finger plays. I recommend every student age 6 and under warm up their fingers by pretending to put on invisible gloves or using the Wunderkeys Finger Warm-ups. You can find the entire playlist of Wunderkeys Finger Warm-ups here!